Spring is nearly upon us, and with it, the hope for an end to this winter's harsh snowstorms. Especially hard hit were the Northeast and Midwest regions, both of which experienced multiple heavy snowfalls. Parts of the Northeast were hit the hardest, with an average of nearly 18 inches per major snowfall. Along with the snow has come another dangerous problem, sagging and collapsed roofs, which have been reported in states like New York and Illinois. Long Island's Smith Haven Hall was evacuated due to leaks in over two dozen of its 140 stores. These leaks are thought to have been caused by the heavy accumulation of snow, up to 7 feet in some areas, on the building's roof. In Des Plaines, Illinois, a popular restaurant- Cafe la Cave- suffered a partial ceiling collapse after a heavy snowstorm. The damage left behind a hole measuring 30 by 50 feet and it will take a few weeks of work before Café La Cave can open its doors to the public again. Both of these businesses have something in common; a flat roof. Flat roofs are more susceptible to snow accumulation and have a higher potential for damage than pitched roofs. One cubic foot of wet snow can weigh about 20 pounds, and that can add up quickly on top of a large flat surface. Make sure your gutters are clear. This allows melting snow to run right off your roof, instead of freezing up and creating dangerous, roof ruining ice dams. Use a roof rake to remove any snow and ice before it can harden. Call a professional roofing company in your area and having them do the job for you. 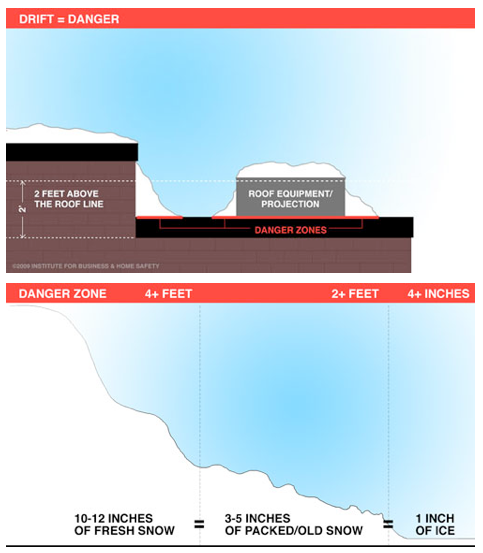 Climbing onto the roof to remove snow, whether you're a business owner or a homeowner, can be a risky activity. With the potential for falls, breaks, and other mishaps, it's a job best left to a professional roofer. If your roof is already overburdened by the weight of the snow, do you really want to get up there and add your weight to the roof as well? "If it all falls at one time and it's really heavy... (that's bad); if it falls over a length of time you're gonna be a little better off," said Jay Bullens of Able Roofing. Do you have a flat, or low-sloped roof with lots of wet, heavy snow? If you have a flat roof, have you noticed any sudden changes? Listen to your roof. Do you hear it creaking, popping, or cracking? Any leaks? Are any of your windows cracked, or are the doors popping open? What about the interior and exterior walls? Are their new cracks or new signs of damage? If you answered yes to any of the above questions, then it's time to have snow removed from your roof. If you hear popping, or see that your roof is sagging, then you should also consider contacting a structural engineer to determine what, if any, damage may have already occurred. Wear protective headgear and goggles when performing any task on your roof. Use a snow rake for pitched roofs. These are available for purchase at any hardware store and have long extension handles, so the snow can be removed without climbing onto the roof. If you have a flat or mildly sloped roof, always start the removal process from the edge of your roof, working your way in. You don't want to add your weight to the load your roof is already carrying. Working inwards from the outside also ensures that you have better footing. Be careful of how much snow you remove. Leave an inch or two behind. This keeps you from scraping the shingles and damaging them. Do not use any metal tools while on your roof. Plastic is better. Metal conducts electricity and is not a good idea to use when working around power lines. Don't use salt on your roof. It's tempting to make that snow melt off that much faster, but the majority of manufacturers will not honor a warranty if a roof has had salt used on it. Dump snow away from the structure. When it melts it won't seep into your building or home and potentially cause water damage. For additional safety tips and details on protecting your roof from a collapse, check out the video below.